These homemade cards are fairly easy to make and because you will use only one colour of ink, embossing powder and a single large rubber stamp, they can be much less costly than purchased cards. This project makes a good introduction to basic stamping and embossing techniques as well as coordinating with our homemade Warm Winter Wishes Gift Bag. Using your rubber stamp positioner, position your rubber stamp image as desired. Stamp the image. I used a single rubber stamp. Before the ink dries, apply white embossing powder to all areas that have been stamped. Shake away any excess powder and if necessary, use a small paint brush to brush away small amounts of powder that have been left behind, around your stamped image. Using your embossing tool or heat gun, apply heat to the embossing powder. Any residual powder left around the image will emboss, so be sure to remove any that is unwanted. 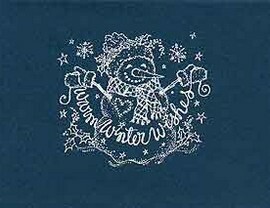 I added an image to the back of the card, using the same method, with a small snowman rubber stamp. These cards are very easy to make. If you have never rubber stamped before, you may want to practice a little on some paper first. The art of stamping takes a little practice to achieve perfect stamped images, but it isn’t all that hard.